As I'm resting from formal classes now, it has become more and more difficult to discipline myself learning Korean properly everyday. So, I'm putting up a goal for myself to resit the TOPIK intermediate exam which I failed last year. 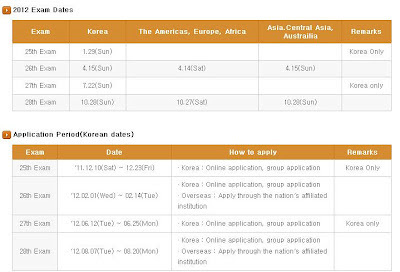 The upcoming 27th TOPIK exam in Korea will be held on 22nd July 2012 and registration starts from 12th June. 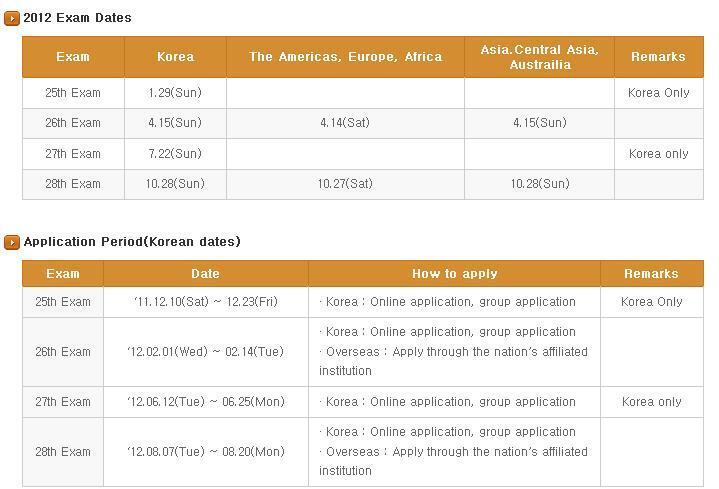 While for other countries (outside Korea) it will be held on 27th and 28th October respectively according to the regions stated. Basically I have about 3 to 4 months to get ready. Will I fail again this time? Mentally I'm prepared, ability wise; I will let the score decides. Yikess..
After failing once, basically I know where my weaknesses are - listening and writing. Let's study and prepare 2-3 times harder this time.